The Zhou dynasty ruled China from 1122 BCE to 256 BCE. In 771 BCE, however, the Zhou capital was sacked by invaders, and the Zhou capital was moved further east. Scholars use this event to divide the history of the Zhou dynasty into two periods: the Western Zhou (1122-771 BCE) and the Eastern Zhou (771-256 BCE). The former was a time of strong kings, who expanded their borders by conquest and colonisation; the second period was one of weak kings who allowed powerful regional states to emerge. The Zhou period as a whole was a time of dramatic change for ancient China, in government, war, philosophy, economy and society. The Zhou (1046–256 BCE) followed the Shang dynasty. Although the dynasty lasted longer than any other in Chinese history, the actual political and military control of China by the Zhou dynasty’s ruling family only lasted during the first half of the period, which scholars call the Western Zhou (1046-771 BCE). We have seen that the old Shang state system formed a kind of confederation of states in which many semi-independent rulers acknowledged the overlordship of the Shang king. One of these states was the kingdom of Zhou, which lay on the western frontiers of the Shang-dominated area, and may not have been fully assimilated into it. In c. 1045 BCE, the powerful and ambitious king of Zhou sent his army to defeat the Shang army in the battle of Muye. The last Shang king committed suicide, and the victor moved the capital to the city of Zengzhou. That period known in ancient Chinese history as the Zhou dynasty had begun. Shortly afterwards, the dynasty’s founder died, to be succeeded by an inexperienced youth. The founder’s brother, however, the duke of Zhou, proved to be a capable and loyal prince. His example of faithful service to the king, and not grasping for supreme power for himself, made him one of the most revered figures in the whole of Chinese history. When many of the former Shang-dominated states to the east tried to shake off Zhou rule, the duke of Zhou led an expedition which brought them firmly under control. The new Zhou rulers consolidated their rule by placing members of their family and other loyal followers in charge of many of the states which had formed the old Shang confederation. Some of the previous lords kept their territories by submitting to Zhou authority, and others were brought into the Zhou royal family by marriage, but the end result was that the old Shang confederation was welded into a much tighter political system under the control of the Zhou royal clan. Thus was laid the foundations of the Western Zhou system of government: the kingdom was divided into principalities, each under a prince who was, in fact or in theory, related to the Zhou royal family. The vassal prince owed the Zhou king loyalty and obedience, was expected to render the king advice, provide labourers for major construction projects, and lead his armed followers on campaigns as part of the Zhou army. This army was constantly engaged expanding the borders of the kingdom at the expense of neighbouring peoples. Within two or three generations of the beginnings of the dynasty, the expansion of the Zhou kingdom had led to it being divided into over one hundred of these principalities. These in turn were subdivided into holdings, or “fiefs”, parcelled out by the princes to their own relatives and followers. This hierarchical system of power proved to be highly effective in expanding the borders of the kingdom. It motivated ambitious military leaders to push out Zhou rule into neighbouring lands in the expectation of being granted a slice of frontier territory as a reward for their efforts. According to traditional Chinese histories, the early Western Zhou kings were supported by a strong army, split into two major units: “the Six Armies of the West” and “the Eight Armies of Zengzhou.” Early Zhou kings were true commanders-in-chief, constantly at war with barbarians. Zhou military power was dealt a major blow, however, when, in c. 977 BCE, the “Six Armies” were wiped out – along with the king – on a campaign in the Yangtze valley. The expansion of Zhou rule was not only outwards into neighbouring lands. 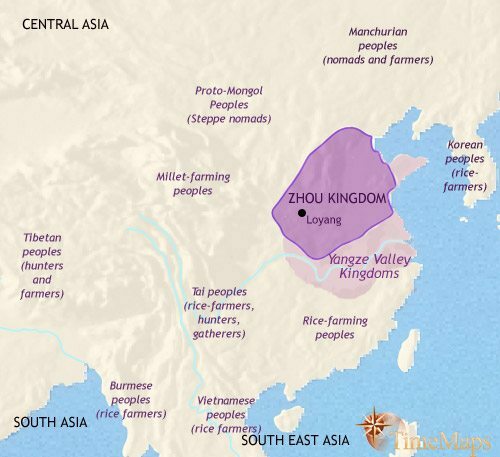 In the early days of the Zhou the principalities which made up the kingdom frequently consisted of a pocket of territory – a small town or city with a small area of farmland around it – which would be surrounded by large tracts of forests and wilderness, inhabited by “barbarians” beyond the reach of Zhou civilization. To deal with this situation, princes would assign areas of as-yet-untamed land to family members or loyal followers, and give them a group of peasant-soldiers and their families with whom to plant a fortified settlement in the wilderness (in a settlement pattern later idealized as the well-field system). Such colonies would act as bases from which the surrounding peoples would be brought under Zhou control. These areas of newly-absorbed land would become new lordships, or “fiefs”, with the original settlements often growing into local market towns and centres of trade, craftsmanship and Zhou culture. In this way, the territories of the Zhou princes, into which the Zhou state had originally been divided, came themselves to be divided into many fiefs. A hierarchy of princes and lords had developed, in which the princes held their territories from the Zhou king in exchange for their loyalty and support, and subordinate lords held their fiefs from the princes, also in exchange for loyalty and support. This was a system similar to the “Feudal System” in Europe, which would grow up more than two thousand years later. The Western Zhou period was a vital and formative one in ancient Chinese history. Literature, music and poetry flourished, bronzes reflected changing cultural preferences and there is abundant evidence for growing trade. An early Zhou palace at Fenzhou, probably the residence of a high ranking member of the royal family, is very similar to those of the Shang, and the early Zhou adopted the ritual and burial practices of the Shang. Typical Shang forms of bronze ritual vessels continued to be made. The burial of chariots, horses and charioteers in pits associated with the nobility also continued from Shang times. One thing that seems to have changed immediately was that the use of oracle bones for divination ceased. With this practice stopped, many priests must have lost much of their importance, perhaps even their jobs. Their literacy skills, however, would have been very useful, and many probably found employment as scribes and officials with the court of the new king, or in the households of the many Zhou princes who now found themselves needing all the help they could get to administer their new territories. In styles of metalwork and other crafts, it was not long before new workmanship and decoration appeared, reflecting wider social changes under the early Zhou. In the 9th century BCE, a ‘ritual revolution’ occurred, reflecting wider changes in society. A bronze industry hitherto dedicated to the provision of specific items for court ritual purposes now turned to the mass production of practically identical pieces. These were purchased by an expanding ruling class, which arose from the multiplying of centres of royal power amongst more than a hundred Zhou rulers of principalities and a much larger number of subordinate lords of fiefs. During these early Zhou centuries, marked regional styles also developed. Zhou expansion may have been driven as much by growing populations as by military aggression. In the early Zhou period agricultural productivity began to rise. Soya beans had been introduced into northern and central China towards the end of the Shang period. This highly nutritious crop was grown as part of a rotational system with millet. This would have significantly expanded the sustenance base of the population, and led to an increase in numbers. Another development at this time was the introduction of the use of iron. Iron objects are much easier and cheaper to produce than bronze ones, because whereas iron is found in many places in the earth, copper and tin are not nearly so widespread. They also have to be carefully smelted together to make bronze. This means that, whereas bronze was used mainly in weapons and decorative objects – that is, used only by kings and priests, lords and officials – iron could be used to make farmers’ tools. As the use of iron spread, farming could become much more productive. Using tough new metal tools where previously they had to use wood, bone or stone ones meant that farmers could carry out more clearing, digging, chopping, ploughing and so on, and so produce more food. The early Zhou political system retained its cohesion for several centuries. The rulers of the principalities which made up the Zhou state continued by and large in their allegiance to the Zhou king, and the frontiers of the Zhou state were pushed ever further outwards, including (despite several major setbacks) into the Yangtze region to the south. As time passed, however, the ties of blood thinned, and the Zhou ruling clan, widely-distributed as it was over many principalities, became increasingly fragmented in its loyalties. At the beginning of the Zhou period, princes given charge over the different territories had often found themselves surrounded by hostile peoples, and dependent on the military of the Zhou king to maintain them in their new positions. Over the centuries, however, their local control had grown with the subjection of indigenous populations and the expansion of the populations at their command. Their local power-bases had become more secure, and they themselves had become more focussed on their own territorial interests rather than on their obligations to the kingdom as a whole. The occurrence of rich burials on a royal scale in different parts of the Zhou realm testifies to the growing independence and power of these princes. By the 8th century, also, the Western Zhou court was facing mounting external pressures. The Western Zhou period came to a sudden end when the royal capital, Haojing, as sacked by a coalition of barbarians and rebels. The Zhou capital was then moved further east, and later scholars have given the term Eastern Zhou to the following period (771-256 BCE). After this, the territorial princes became virtually independent rulers, with the ZhÅï¿½u kings ruling in name only. From being a single political entity, ancient China became fragmented amongst numerous competing states. Political fragmentation would however be accompanied by great economic and cultural advance, one of the most creative phases in China’s long history. The Eastern Zhou kings were too weak to control the power of the territorial princes. With a power vacuum at the centre, the numerous Zhou principalities, untrammelled by the need to heed the king’s authority, fought ceaselessly amongst themselves. The stronger annexing the weaker, and large and powerful regional states began to emerge. These states formed the central players in this new phase of ancient Chinese history. The next few centuries are traditionally called (after the chronicles depicting the times) the “Spring and Autumn” period (770-476 BCE), and the “Warring States” period (476-221 BCE). Such are the continuities between them, however, that for our purposes they are best treated as one period. Together they mark one of the most important phases of all Chinese history. With the decline in the royal authority of the Zhou kings, the later Zhou period saw the rise of a new trans-state system to regulate the conflict between the states. This was the “Ba” system, in which the predominance of the ruler of one leading state was accepted by the others. No “Ba” alliance ever included all the states, nor was any alliance permanent; the leading states changed on a regular basis, and for much of the time there was no “Ba” alliance in force – they tended to arise to meet particular threats. In time this system was to prove inadequate in controlling the conflict between the states; this was only resolved when one of the states triumphed over all the rest. In the first centuries of the Eastern Zhou period, the forces which the states fielded against each other were based on chariots, manned by warrior-aristocrats who fought according to widely recognised rules of war. Later, however, as populations grew, the economy expanded and states became larger, better organized and more powerful (see below), permanent armies could now be maintained. This greatly contributed to the militarization of the states during this period. The “Warring States” period in particular was a time when wars of increasing intensity were fought between ever-larger armies, and led to the annihilation of states and their ruling houses. Unsurprisingly the period saw major advances in both military strategy and technology. One of the world’s classics of military literature, Sunzu’s The Art of War appeared at this time (although traditionally dated to some time earlier), and the cross-bow, one of the most important innovations in military technology before firearms, was probably first used in 4th century. These armies came to be commanded by professional generals, increasingly of non-aristocratic birth. Actual warfare was supplemented by active diplomacy, as states tried to forge alliances against their enemies. Spies were used liberally, enemy ministers were assassinated, corrupted or blackmailed, and all ways were used to gain advantage over other states. The mode of thought behind these practices is well illustrated in Sunzu’s The Art of War. The Chinese states did not only fight amongst themselves. The threat from barbarians beyond the frontiers of Chinese civilization, especially from the steppes of central Asia, continued to mount. Several states in the northern frontier areas built long walls to keep out the steppe nomads, as well as invasions from neighbouring states. To achieve success in war, the more successful princes changed the way they governed their territories – or states, as we should now call them. To make their military power more effective, they needed to raise and maintain large numbers of troops – who of course required paying. This in turn required taxes to be collected regularly and effectively. In the early Zhou period, princes had relied on their subordinate lords to contribute the bulk of the troops needed for their armies, as well as labourers for public works projects and taxes to pay for the army and government. These practices continued into the later Zhou period, but they proved increasingly inadequate for the new conditions. Increasingly the princes used their own household officials and personal retainers to collect the taxes directly from the villages and to recruit the men for their armies. All the leading states of the period expanded the number of officials they employed, so that their governments could regulate and tax their populations more effectively. Moreover, following the example of Chu, the leading states divided their territories into districts headed by officials (prefects) appointed by the government to administer the localities, further restricting the power of the local aristocracies. The kings’ ministers were increasingly men of ability and long experience. Below them, These officials came to form a new element within society – educated, professional civil-servants, appointed to their tasks on the basis of their ability and loyalty to the prince rather than on noble birth. These were the first “scholar-officials” belonging to the new “gentry” class, which would play such a key role in later Chinese history. This fragmentation of power marked the beginning of a period of technological advance and economic expansion. The more successful of the princes realized that military and political power rested upon a sound economic base. They took steps to develop trade and industry within their states. Metal coins were first introduced in ancient China at this time (at about the same time as they were in the Middle East), and this would have helped stimulate trade. The first large-scale irrigation projects were begun, to bring more land under cultivation and improve agricultural production. These often required the digging of canals, which would have greatly benefited trade (as carrying goods by water was always much cheaper than by land until the coming of railways). Iron tools gradually became more common in agriculture. Chinese iron-workers began using casting technologies from c. 500 BCE, to manufacture huge quantities of iron tools and weapons. The casting of molten iron into moulds, requiring the control of very high temperatures, was not matched in the West for centuries to come. Foundries were large-scale industrial units, as were salt and coal mines. The introduction of cast-iron agricultural tools greatly increased the productivity of the land, and acted as a further stimulus to population growth. Towns and cities increased in both size and number, though since buildings were made largely of wood very little has survived from this period. The density of populations within the walls of these towns was much higher than in Shang times. All these developments stimulated social mobility. Peasants were able to buy and sell their land more easily, with the result that farms became more productive. New towns sprung up around markets. The merchant class was growing as the economy expanded. Some merchants amassed large fortunes and were able to invest their wealth in land, so joining the landowning class. Chinese society was becoming much more fluid, with different social classes growing up between the peasants, on the one hand, and the nobility on the other. And as we have seen (above) the increasing centralization of state power in the hands of princes and their officials opened the way to high office (and with it great wealth) for men of humble background. The growth of bureaucracy began the rise of a key new class in ancient Chinese society, the gentry. This period witnessed a general advance in education, stimulated by the greatly increased demand for highly literate officials. The tomb of Xi, a civil servant of the state of Qin, has revealed a mass of written documents, showing the extent to which law, diplomacy and administration now depended upon a literate class of bureaucrats. Not unconnected to this, during the Eastern Zhou period Chinese philosophy developed, its initial stages beginning in the 6th century BCE. The Eastern Zhou period was a time of change and uncertainty. The old order was vanishing – what would replace it? It was as a time of frequent warfare and violence, but also of economic growth, increased trade, towns and cities growing in size, the rise of new social classes such as merchants and government officials. Confidence in traditional beliefs and practices was being undermined. It is no surprise that these times of change should bring forward teachers who sought to give guidance as to how people should behave and how society should operate. These teachers usually belonged to the well-educated gentry class, which was producing the growing number of government officials and which was therefore now gaining increasing prominence. Members of this class often moved around from state to state, offering their services to different princes. Likewise, a number of teachers arose and also travelled from court to court, offering advice to rulers and ministers, but also teaching and gathering disciples. The whole period of the Eastern Zhou is also known as the period of “the One Hundred Schools” – a time when numerous teachers and their disciples preached new beliefs and new ways of doing things. Many of these “schools” soon died out, but four were to have a deep impact on later Chinese society: Confucianism, Legalism, Mohism, and Taoism. The greatest Chinese philosophers were Confucius (551-479 BCE), founder of Confucianism, and Laozi (slightly earlier in the 6th century), the founder of Daoism. Other philosophers, theorists, and schools of thought in this era were founded by Mozi (470-391 BCE, the founder of Mohism) and Shang Yang (390-338 BCE) and Han Fei (280-233 BCE), responsible for the development of Legalism, a school of thought in ancient China which would later be immensely influential. Other famous philosophers were the Confucian thinkers Mencius (372-289) and Xunzi (312-230). One of the symbolic changes which marked the Warring States period from the earlier Spring and Autumn period was the fact that the rulers of the surviving states did not even bother to acknowledge the Zhou king as their superior. They declaring themselves to be independent kings, ruling in their own right. Eventually the Zhou dynasty came to an end in 256 BCE, when one of these kingdoms, Qin, marched on the Zhou capital and annexed the rump of territory still controlled by the Zhou king. The late Zhou world was divided between a core area and a surrounding (and expanding) peripheral area. States outside the core area were viewed as at best semi-barbarous. Inside the core area, states were subject to factionalism and splintering, and new states arose on the ruins of old; however, it was the states outside the core area which were able to expand their territories and so gain in power. Barbarous though they may have appeared to the civilized inhabitants of the core states, it was these frontier states which had become dominant by the Warring States period. Southern states, beyond the pale of the early Zhou sphere, were gradually drawn into the Zhou state system in later Zhou times, as the older Zhou states of northern China reached out for allies in their constant struggles with one another. Some of the southern states, especially Chu, in the middle Yangze basin, Wu and Yue in lower Yangze, and Shu of Sichuan, became amongst the most powerful of the states. It was none of these, however, which eventually triumphed over all the other states. This state was Qin, and it was the founder of the Qin dynasty who therefore became the First Emperor of China, in 221 BCE. His reign marked the transition to a new phase in ancient Chinese history.